ArchitectureChicago PLUS: Really bad photos of the renderings the Chicago Children's Museum doesn't want you to see. Really bad photos of the renderings the Chicago Children's Museum doesn't want you to see. At a September 10th meeting at Daley Bicentennial Plaza, Chicago Children's Museum architect Mark Sexton presented a full set of renderings of Krueck and Sexton's proposed design for a new 100,000-square-foot museum in Grant Park. Unfortunately, as part of its slippery and cynically deceptive media campaign, CCM has withheld all renderings from the media except extremely wide-angled views that deliberately de-emphasize the building's impact on the park. Krueck and Sexton Architects also does not include the renderings on their web site, but they have signed on to Mayor Richard M. Daley's "all opponents to the museum are racists"campaign by posting links to four articles regurgitating Daley's spurious, gutter-politics rants. The links include news reports from the Trib and Sun-Times on those very calculated mayoral tantrums, but, of course, no links to those same papers' strong condemnation of the mayor's tactics and fervent opposition to the museum's move to Grant Park. These two admittedly pathetic photos are the best I could get from my vantage point in an outside hallway which I shared with local residents who had been banished from their own community meeting when it was hijacked by CCM supporters. They more accurately depict how a human being - as opposed to a high-flying bird or low-flying airplane - would actually experience the park with the CCM's building inserted into it. The first rendering is of the large central courtyard; the second of the soaring, stalagmite-like skylights required to bring light into the museum's subterranean halls. Note how those skylights, up to 51 feet in height, rise many times higher and overwhelm the human figures inserted into the rendering. Even with all their oblique bluriness, the photos of these renderings demonstrate that, contrary to the claims of the museum, the structure would create a fatally intrusive presence in the park. If the museum doesn't agree, they should release ALL the renderings, which I will be glad to post on my web site. Let the public decide. Whoaaaa! This blog is awesome. just fantastic journalism work. great detective work! oh my gosh. the CCM building looks like a massive sunken temple, no doubt inspired by the emerald city from the land of oz. Which is probably the theme for their first big gala fundraiser. NOTE: there is no park or grass, or gardens covering it over at all! (as CCM supporters have falsely claimed.) what a horrible monstrosity. it's way over the top. how awful. totally inappropriate for the site in grant park. this design most surely is a violation of montgomery wards edict. thank you again for publishing this. these pictures make for a powerful argument to squash this project. Thanks for your comments. I should mention, however, that there are trees and grass on other parts of the site. 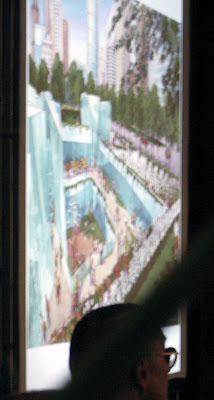 These renderings depict only the constructed part, and how visitors to the park would relate to them. The new renderings make the buildings seem more "HERE I AM"! than the other building (that looked like ice cubes poking out of the ground). To be perfectly honest I liked the ice cubes better, but I hated the idea of a building in the original Grant Park area, (since Grant Park had been expanded to include Millennium, since of course no one would consider having an area of railroads be a park) the ice cubes would be great somewhere else. Those pictures are not legible enough to warrant an article on K&Sexton's design!?! It is obvious that you are against having the CCM replace the parking decks. Thank you for fabricating more propaganda as you did with your 'Portrait" article. Your comment mentioning that the BiCenn Park is as wide as Millenium Park is not true either. The Cancer garden and the land east of it was not in the original BiCenn plan, it was merely attached thanks to the construction of the new LSD 'S' curve. They'll have to do because K&S and Museum refuse the release the originals. Hardly a vote of confidence in their own designs. And I think they're quite clear enough to indicate how beyond human scale those skylights are. Even if you lop off the ne corner and draw a straight line due north from Monroe and LSD, the Daley Bicentennial site is still almost as wide as Millennium's footprint. Propaganda: Anything that confronts spin with an unwanted element of truth. Please tell me this new attempt by Emperor, I mean Mayor Daley has been foiled by the far more reasonable citizens of Chicago?